Article by Nicholas CLARKE, the heritage consultant on the project. Many a distressed post dating over the past two years can be found on the Heritage Portal regarding the disastrous state of preservation of the old Carnegie Library in Germiston as well as the lack of care for the Commonwealth Memorial (also known as the Cenotaph) to the Great War (World War I) on Market Square. Both stand, seemingly abandoned, awaiting new use. The site was fenced of by Ekurhuleni Metro to ensure that the site not be further vandalised. The good news is that plans are afoot to restore the Cenotaph and transform the ruins of the Carnegie Library into a new Civic Theatre. Plans have been in the pipeline for some years and many people in Germiston are aware of indications that the project would have been completed by June 2012. As with most things in life complications emerged during the process, not only in terms of the administration of the project, but also in terms of physical restraints such as soil conditions. Site works are planned to start! The stabilisation of the extant walls the first priority. To this aim demolition of the non-descript and much altered back walls of the library are set to start to allow for the establishment of permanent bracing structures which will not only protect the walls during construction but remain permanently to ensure the stability of what remains of the Germiston Carnegie Library. Construction of the Carnegie Germiston Library was made possible by the Carnegie Corporation, a philanthropic trust based in the USA. Andrew Carnegie established the Carnegie Corporation in 1911 to promote the advancement and diffusion of knowledge and understanding. As part of that endeavour, the Corporation has been financially supporting libraries for over a century. The Corporation funded the contraction of libraries in English-speaking countries and colonies. Between 1883 and 1929 a total of 2509 libraries were constructed of which 12 were built in South Africa. These were: Barberton (1911), Benoni (1913), Germiston (1915), Harrismith (1907), Hopetown (1908), Krugersdorp (1917), Moorreesburg (1911), Muizenberg (1909), Newcastle (1913), Potchefstroom (1912) and Standerton (1911). 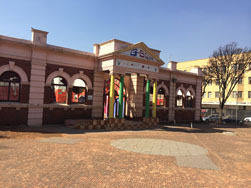 The decision to fund the construction of a library in Germiston was made on 16 March 1915 when a grant amounting to $26 407 was granted towards its contraction, the largest amount for any Carnegie Library in South Africa. But who was Andrew Carnegie? Born in to poor parents in Scotland in 1835, he emigrated with his family to the United States of America in 1948. His first job was as telegrapher, but being a shrewd businessman by nature, quickly started investing in new infrastructural developments, especially those associated with the rapid rail expansion of his day. By the 1860's he had already amassed a small fortune, but grew his financial interests by investing in oil and in selling bonds for American industrial projects in Europe. His real fortune, however came from his 1901 sale of his Pittsburgh based Carnegie Steel Company to JP Morgan for a then staggering US$480 million. With this fortune secure he retired at the age of 66. He devoted the rest of his life to philanthropy, funding the construction of the New York Carnegie Hall, and setting up the Carnegie Corporation of New York in 1911 with the aim: to promote the advancement and diffusion of knowledge and understanding. He was a social activist and anti-imperialist. He once offered the peoples of the Philippines US$20 million so that the Fillipine peoples could buy their independence from the United States, who had just bought the islands from Spain for the same amount! Of course the request for the corporation to fund a library had to come from the towns and cities. The first proposals to establish a library for Germiston dated to 1905, but it was only by 1909 that the first municipal library was established in a small room in the municipal office. The Carnegie Corporation funding changed all that and by 1922 the new library, designed by the Municipal engineer, Mr BRIGHT, was opened. Time has not been kind to the old Library building. At one time it served as a restaurant, then club and by 2013 was derelict when a fire broke out and destroyed what remained of the Library. Today only the outer walls remain. The original main entrance doors are in safekeeping with the Ekurhuleni Metropolitan Municipality. Participation of South African citizens in the Great War (World War I 1914-1918) was voluntary. This made the losses sustained all the more poignant. The Germiston Cenotaph was unveiled on 24 October 1924, dedicated "to our Glorious dead." The designer has not been traced yet, but the design has a very clear relationship with the London Cenotaph designed by Sir Edwin LUTYENS and unveiled in 1920. Many more cenotaphs were modelled on the mould of the Lutyens design and include that of Hong Kong. Auckland, Toronto, and Hamilton, Bermuda. The Germiston Cenotaph therefore is a member of an international family of cenotaphs, all following the same basic design. The Cenotaph has also suffered from the ravages of time and abandonment. The bronze plaques were stolen in 2013. It now stands abandoned and vandalised. Plans to convert the Carnegie Library site to use as a theatre go back as far as 2010. It has been the flagship project to kick-start urban renewal in the Germiston centre, a project that is being undertaken with, in part, advice from the city of Breda in The Netherlands. For the theatre, consultants were appointed to develop a design and approval processes were started. When the consultants failed to bring the project to completion within their contract period it was put on hold. New consultants were appointed to complete the project. This new team found that, due to poor soil conditions, excavations for the new building would very likely lead to collapse of the existing ruin - and this was definitely not on the cards! The architect, KWPCREATE, recommended a redesign based on the principles of the first design. This process has now been undertaken with input of heritage practitioners CULTMATRIX. KWPCreate have redesigned the project within the bounds of the original project that include seating for 420 theatregoers, but the new design contains a second informal theatre space in the foyer. For the full CULTMATRIX proposal see The Heritage Portal.